For over 10 years, Domingo Pianezzi has trained surfers on the Peruvian beach town of San Bartolo. Mostly people, but sometimes he’s also helped train animals to surf. In his case, he has a dog that he’s trained to surf with him, and he even participates in international pet surfing competitions. Since he knew he could do it with dogs, why not try his luck with something a little more Peruvian? Pisco the surfing alpaca is his newest prize pupil. Neatorama passed along a great video of Pisco in action. “I’ve surfed with a dog, a parrot, a hamster and a cat, but when I was at a competition in Australia I saw people surfing with kangaroos and koalas,” said Pianezzi. 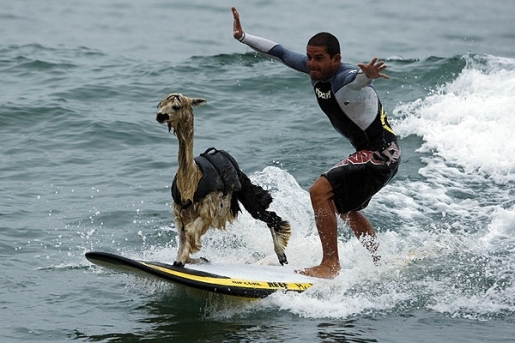 “So I thought that, as a Peruvian, it would be interesting to surf with a unique animal that represents Peru.” While the alpaca got a little too scared to surf after his third wave, the initial run was a success. It’s only a matter of time before Pisco becomes a fixture on San Bartolo’s beaches.